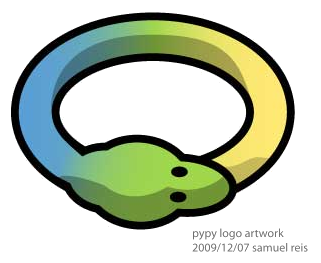 PyPy is a very compliant Python interpreter, almost a drop-in replacement for CPython. It is fast (pypy 1.4 and cpython 2.6 comparison). Numerous speed achievements are described on our blog. Normalized speed charts comparing pypy 1.4 and pypy 1.3 as well as pypy 1.4 and cpython 2.6 are available on the benchmark website. For the impatient: yes, we got a lot faster! 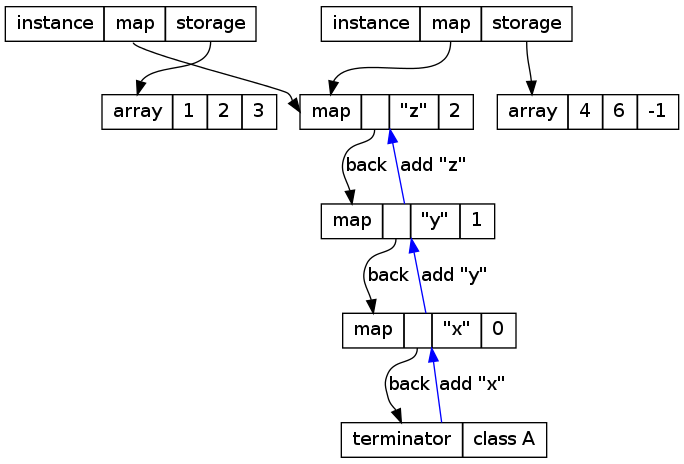 PyPy's built-in Just-in-Time compiler is fully transparent and automatically generated; it now also has very reasonable memory requirements. The total memory used by a very complex and long-running process (translating PyPy itself) is within 1.5x to at most 2x the memory needed by CPython, for a speed-up of 2x. In our previous blog post, we talked about how fast PyPy can translate itself compared to CPython. However, the price to pay for the 2x speedup was an huge amount of memory: actually, it was so huge that a standard -Ojit compilation could not be completed on 32-bit because it required more than the 4 GB of RAM that are addressable on that platform. 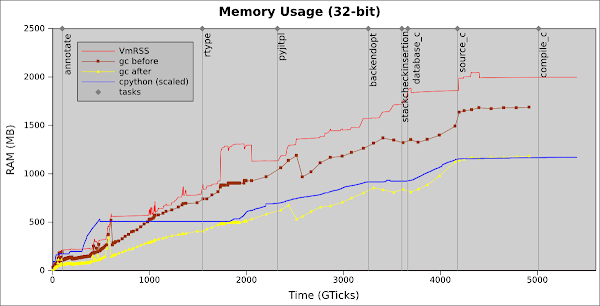 On 64-bit, it consumed 8.3 GB of RAM instead of the 2.3 GB needed by CPython. This behavior was mainly caused by the JIT, because at the time we wrote the blog post the generated assembler was kept alive forever, together with some big data structure needed to execute it. In the past two weeks Anto and Armin attacked the issue in the jit-free branch, which has been recently merged to trunk. The branch solves several issues. The main idea of the branch is that if a loop has not been executed for a certain amount of time (controlled by the new loop_longevity JIT parameter) we consider it "old" and no longer needed, thus we deallocate it. To understand the freeing of loops some more, let's look at how many loops are actually created during a translation. 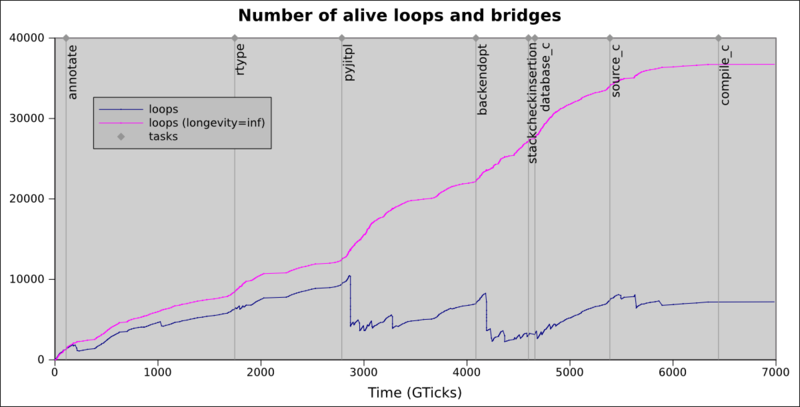 The purple line in the following graph shows how many loops (and bridges) are alive at any point in time with an infinite longevity, which is equivalent to the situation we had before the jit-free branch. By contrast, the blue line shows the number of loops that you get in the current trunk: the difference is evident, as now we never have more than 10000 loops alive, while previously we got up to about 37000 ones. The time on the X axis is expressed in "Giga Ticks", where a tick is the value read out of the Time Stamp Counter of the CPU. 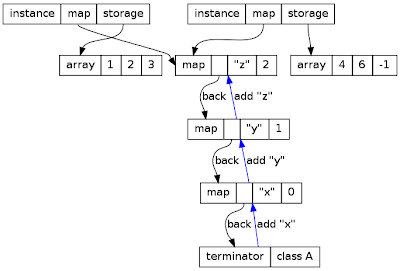 annotate performs control flow graph construction and type inference. rtype lowers the abstraction level of the control flow graphs with types to that of C.
backendopt optimizes the control flow graphs. stackcheckinsertion finds the places in the call graph that can overflow the C stack and inserts checks that raise an exception instead. 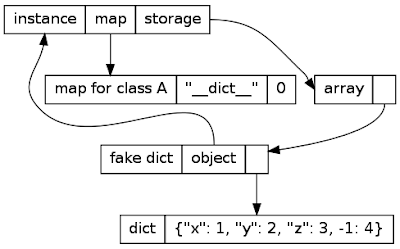 database_c produces a database of all the objects the C code will have to know about. source_c produces the C source code. compile_c calls the compiler to produce the executable. You can nicely see, how the number of alive graphs drops shortly after the beginning of a new phase. Those two fixes, freeing loops and generators, improve the memory usage greatly: now, translating PyPy on PyPy on 32-bit consumes 2 GB of RAM, while on CPython it consumes 1.1 GB. This result can even be improved somewhat, because we are not actually freeing the assembler code itself, but only the large data structures around it; we can consider it as a residual memory leak of around 150 MB in this case. This will be fixed in the jit-free-asm branch. 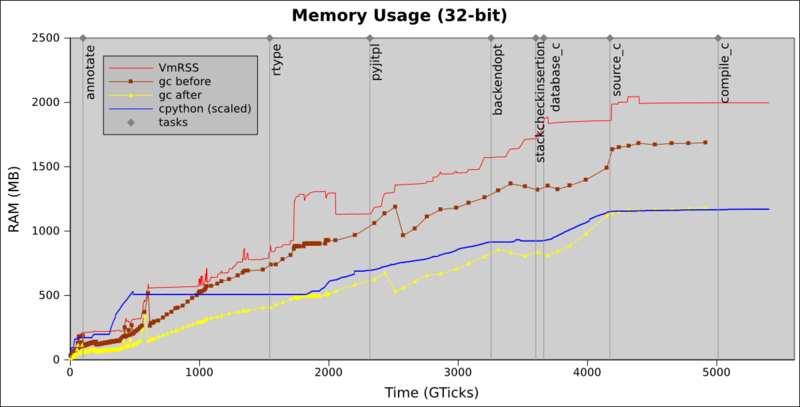 By comparing gc-after and cpython-scaled, we can see that PyPy uses mostly the same amount of memory as CPython for storing the application objects (due to reference counting the memory usage in CPython is always very close to the actually necessary memory). The extra memory used by PyPy is due to the GC delta, to the machine code generated by the JIT and probably to some other external effect (such as e.g. Memory Fragmentation). Note that the GC delta can be set arbitrarly low (another recent addition -- the default value depends on the actual RAM on your computer; it probably works to translate if your computer has precisely 2 GB, because in this case the GC delta and thus the total memory usage will be somewhat lower than reported here), but the cost is to have more frequent major collections and thus a higher run-time overhead. The same is true for the memory needed by the JIT, which can be reduced by telling the JIT to compile less often or to discard old loops more frequently. 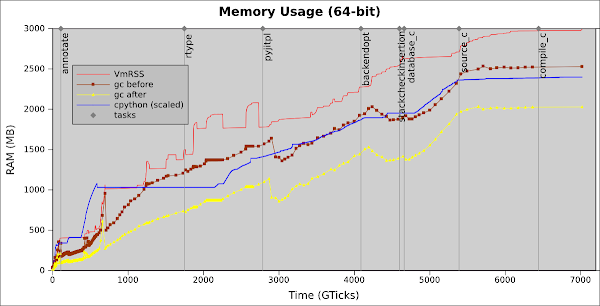 As often happens in computer science, there is a trade-off between space and time, and currently for this particular example PyPy runs twice as fast as CPython by doubling the memory usage. We hope to improve even more on this trade-off. The general shape of the lines is similar to the 32-bit graph. However, the relative difference to CPython is much better: we need about 3 GB of RAM, just 24% more than the 2.4 GB needed by CPython. And we are still more than 2x faster! The memory saving is due (partly?) to the vtable ptr optimization, which is enabled by default on 64-bit because it has no speed penalty (see Unifying the vtable ptr with the GC header). 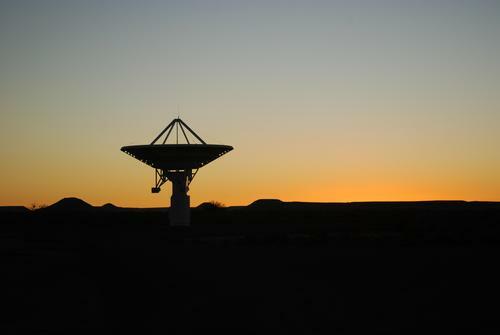 The net result of our work is that now translating PyPy on PyPy is practical and takes less than 30 minutes. It's impressive how quickly you get used to translation taking half the time -- now we cannot use CPython any more for that because it feels too slow :-). Good news. PyPy is now a member of the Software Freedom Conservancy (SFC), see the SFC blog post. 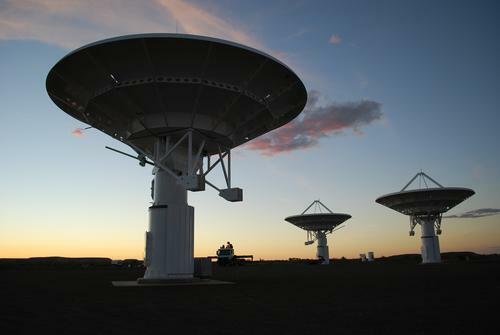 This allows us to manage non-profit monetary aspects of the project independently from a company or particular persons. So we can now officially receive donations both from people prefering right or left sides, see the Donate buttons on our home page and our blog. And you can use PayPal or Google Checkout, Donations are tax-exempt in the USA and hopefully soon in Europe as well. What's it going to get used for? For the immediate future we intend to use the donations for funding travels of core contributors to PyPy sprints who otherwise can't afford to come. So if you have no time but some money you can help to encourage coding contributors to care for PyPy. If we end up with bigger sums we'll see and take suggestions. Money spending decisions will be done by core PyPy people according to non-profit guidelines. And we'll post information from time to time about how much we got and where the money went. If you have any questions regarding the SFC membership or donations you may send email to sfc at pypy.org which will be observed by Carl Friedrich Bolz, Jacob Hallen and Holger Krekel - the initial PyPy SFC representatives on behalf of the PyPy team. Many thanks go out to Bradley M. Kuhn for helping to implement the PyPy SFC membership. We have to admit: even if we have been writing for years about the fantastic speedups that the PyPy JIT gives, we, the PyPy developers, still don't use it for our daily routine. Until today :-). Readers brave enough to run translate.py to translate PyPy by themselves surely know that the process takes quite a long time to complete, about a hour on super-fast hardware and even more on average computers. Unfortunately, it happened that translate.py was a bad match for our JIT and thus ran much slower on PyPy than on CPython. One of the main reasons is that the PyPy translation toolchain makes heavy use of custom metaclasses, and until few weeks ago metaclasses disabled some of the central optimizations which make PyPy so fast. During the recent Düsseldorf sprint, Armin and Carl Friedrich fixed this problem and re-enabled all the optimizations even in presence of metaclasses. 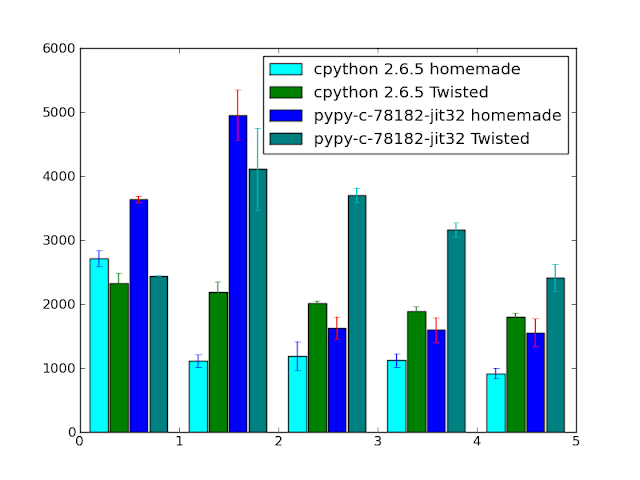 Yes, it's not a typo: PyPy is almost two times faster than CPython! Moreover, we can see that PyPy is faster in each of the individual steps apart compile_c, which consists in just a call to make to invoke gcc. The slowdown comes from the fact that the Makefile also contains a lot of calls to the trackgcroot.py script, which happens to perform badly on PyPy but we did not investigate why yet. However, there is also a drawback: on this specific benchmark, PyPy consumes much more memory than CPython. The reason why the command line above contains --no-allworkingmodules is that if we include all the modules the translation crashes when it's complete at 99% because it consumes all the 4GB of memory which is addressable by a 32-bit process. A partial explanation if that so far the assembler generated by the PyPy JIT is immortal, and the memory allocated for it is never reclaimed. This is clearly bad for a program like translate.py which is divided into several independent steps, and for which most of the code generated in each step could be safely be thrown away when it's completed. The results are comparable with the 32-bit case: PyPy is still almost 2 times faster than CPython. And it also shows that our 64-bit JIT backend is as good as the 32-bit one. Again, the drawback is in the consumed memory: CPython used 2.3 GB while PyPy took 8.3 GB. 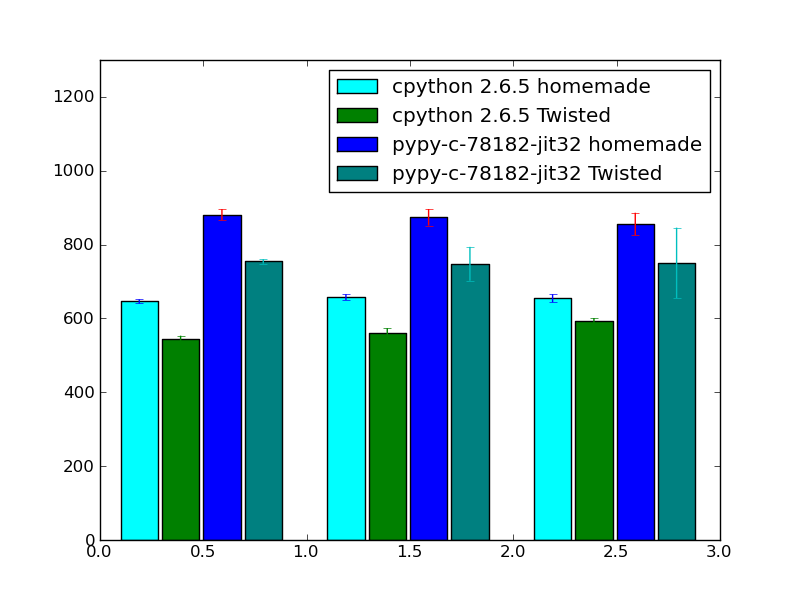 Overall, the results are impressive: we knew that PyPy can be good at optimizing small benchmarks and even middle-sized programs, but as far as we know this is the first example in which it heavily optimizes a huge, real world application. And, believe us, the PyPy translation toolchain is complex enough to contains all kinds of dirty tricks and black magic that make Python lovable and hard to optimize :-).